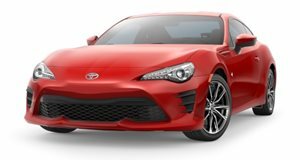 Too many words have been written about the Toyota 86 being the perfect car if ONLY it had more power. But not everyone digs the sports car’s styling, and digital illustrator Jon Sibal has provided us with a glimpse of what the Japanese coupe would look like wearing a custom body kit. If you’re a fan of the whole Liberty Walk, widebody, slammed-and-stanced, thing then this could be right up your street. With beefy front and rear fenders housing a set of cambered, gold-painted alloys, a front splitter and side skirts that are practically scraping the pavement, and headlights with a piercing red light at the center to match the blood red paint work, this thing is evil. However, as good as this imaginary 86 looks, the only way you’re gonna get people interested is with more power. One clever cat has done just that, adding the 4.5-liter V8 from the Ferrari 458 Italia into his Toyota 86 with hilarious results. Now, Toyota doesn't have to go to such extreme measures to please the purists. Just an extra 50-100 horses should do the trick.